Carol and her partner Annie were teachers, both were in full time jobs. They envisaged borrowing to buy land but did not have to as land was gifted to them. They bought an old house for $400 which when demolished was used mainly in the construction of the ground floor. Recycled materials, for example windows and doors, were used wherever possible and a lot of such materials were given by friends. Home purchase was definitely not an option for Carol as she had no credit rating and no savings. Carol desired the security of tenure that rented accommodation does not afford and a realisation that by building you don't need to mortgage your life away to have your own house. 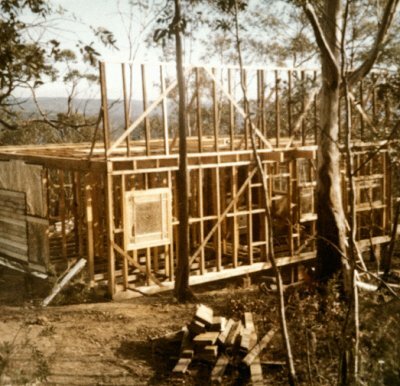 Self build was a cheap option, it gave Carol and Annie each a 50% equity in the house. Carol says that although in the first of the first two years of building most of her spare cash went into the house, she actually 'saved' money because her social life was building. 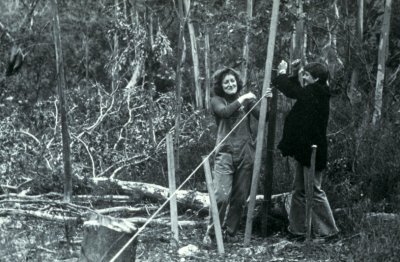 Annie and Carol had talked about buying land and building a house for about six months prior to the land being gifted to them. Carol and A decided to build as soon as the land was available. This was December 1975, and construction started on February 1st 1976. After work -cleaned bricks, second hand weatherboards and windows. Worked on house designs, ordering timber, etc.. Weekends -bearers, framework, fireplace, combustion stove foundation. Mid year holidays -Power- not a lot of work this winter as it was freezing, had down stairs fully framed and clad by July 1976. September holidays -finishing of downstairs, lining and windows. Began bathroom and second floor. Weekends the same, just plugging along. Summer holidays -finished verandah, roof and cladding second floor. Easter -Installed lining and insulation upstairs. Carol said she and Annie put in ten or eleven hour days during school breaks. Carol described her average working day during spring and summer, in the time before ozone warnings, in the following way. Carol found working full time was definitely a hindrance, it seemed such a slow slog sometimes. "Everything takes longer than you think." The whole process took "heaps and heaps" longer than either of them envisaged. Framing -seeing it take shape. The community stuff, working bees and friendships gained. It took a hell of a long time to build it! And finishing off....! Carol said she was able to move in 18 months after she began clearing the site. 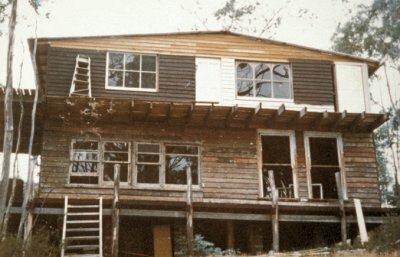 The house was by no means finished at this stage, but livable. Another 18 months after that and probably 20 years later there are still things that could be done.